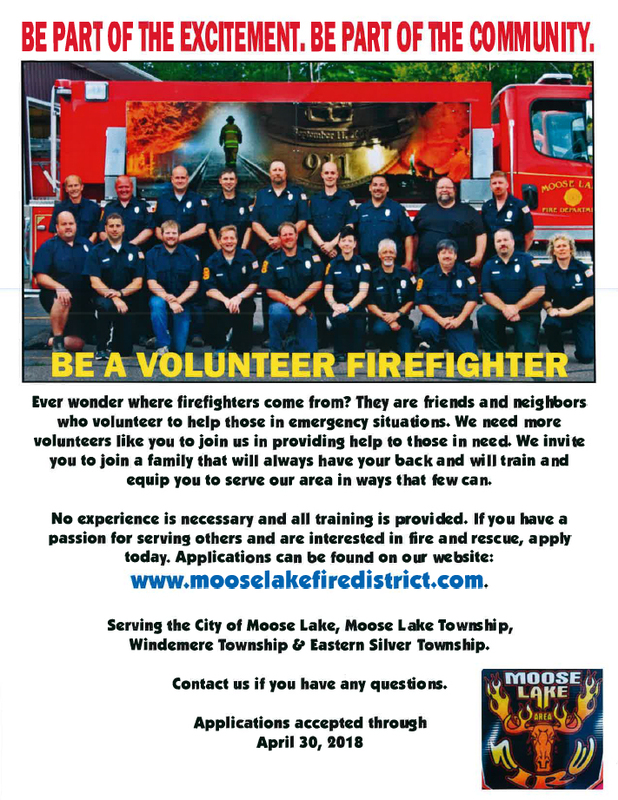 Thank you for your interest in becoming a member of the Moose Lake Area Fire Department. Before you complete the enclosed application, please read the following information and job description. We have provided fire and rescue services to this area for over 50 years. 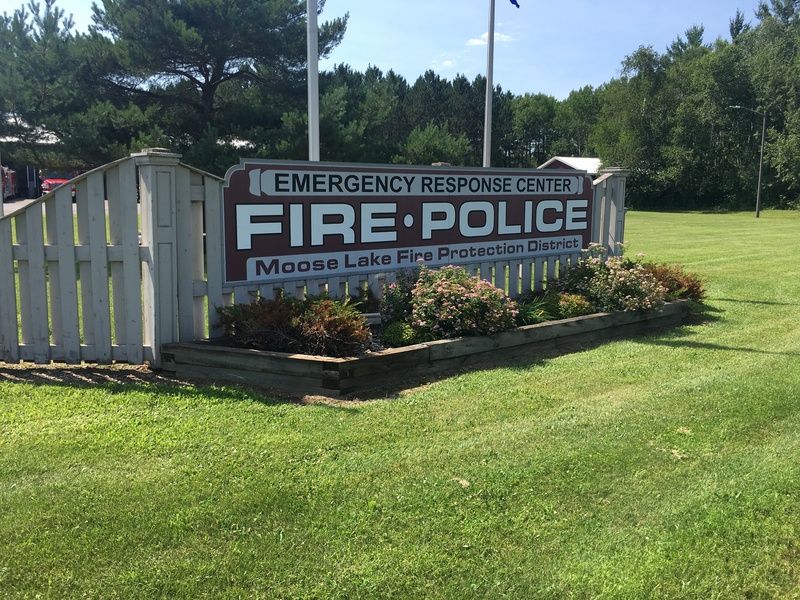 Our governing body is the Moose Lake Area Fire Protection District with representatives from the City of Moose Lake and Moose Lake Township. 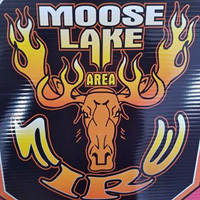 Our primary service area is the City of Moose Lake, Moose Lake Township, Eastern Silver Township and Windemere Township. We have two meetings monthly, on the first and third Wednesdays. One is a training meeting, the other a business meeting. We also have training occasionally on a Saturday, and provide other opportunities for specialized training. Public Fire Safety education is provided to our schools as well as citizens of the area we serve. Our average number of calls per year is 350. We are an equal opportunity employer and follow those guidelines. Those selected for membership must successfully complete each portion of the process and be available to serve. Members must be able to respond to fire alarms and other emergencies and using skills learned extinguish or control fires as a member of a team under the guidance of an officer. Members must be able to work as a team member under stress caused by emergencies and work in adverse conditions and danger in a fast manner while concentrating on the task at hand. High school diploma or equivalent. Must be capable of reading fire protection handbooks understand instructions and directions and be able to communicate with others. Must be able to select, drag, lift and carry hose and nozzles depending upon type of fire. Must be able to position and climb ladders to access upper levels of buildings or to assist in rescue operations. Must be able to create openings in buildings or other containers using ax, chainsaw or other equipment. Must be able to protect property through the use of salvage covers, smoke ejectors or other equipment. Must be able to administer first aid and CPR. Must wear appropriate approved protective equipment for the incident. Must be able to perform the duties in the care and maintenance of equipment and facility. Must participate in training drills, learning correct procedures and operations for fire fighting and rescue. Lifting: May be required to lift 100 lbs. or more. Must not have any back problems. Walking/ Mobility: Must be able to walk, or crawl while carrying, lifting, or dragging equipment. Must be able to steady oneself and have balance. Must have a full range of movement with hands & arms. Must be capable of using hands to grasp, hold, seize, turn or to perceive objects as to size, shape, temperature or texture. Must be able to ascend and descend ladders and stairs. Fire and rescue service is one in which you will work outside as well as inside under various extreme conditions such as heat, cold, dampness, wetness and humidity which will cause marked bodily discomfort. Noise levels may exceed 80 decibels either constantly or intermittently. A variety of physical hazards may be present including the proximity to mechanical moving parts, electrical shock, working in high places, and the exposure to burns, radiant heat and toxic chemicals. You may also be exposed to the visual, smells and sounds of victims who are injured or deceased from fire or other incidents. Each member of the department is provided with adequate protective equipment that meets the standards for personal safety, and is trained on its proper wear. Every effort is made to assure the safety of the member on scene as well as enroute and policy dictates the wearing of appropriate equipment. Each member is expected to attend the meetings and training sessions held for the department and to be an active member of the team providing service to the area. Outside interests or activities that do not allow your participation is not beneficial to you as a member, or other members of the team. Considerations are given for family and job obligations if it is necessary to miss meetings or training sessions. All members are provided a policy manual which spells out your responsibilities. If you have any questions or concerns about the preceding information, please contact the Fire Chief. Please complete the application and return it.